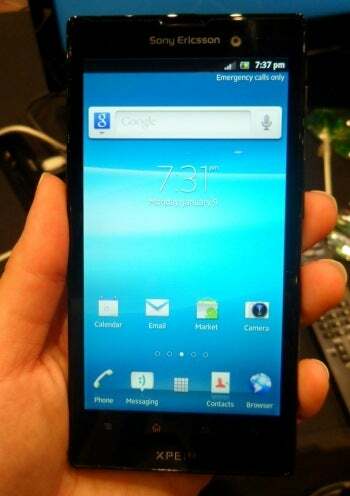 The Sony Xperia Ion smartphone, announced Monday, has some pretty drool-worthy specs. Not only does it hook into AT&T’s LTE 4G network, but it has a 4.6-inch display, HDMI-out with a TV launcher interface, and a super thin design. Oh--and a 12-megapixel camera. Yep, you read that right--a 12-megapixel camera. And it is pretty darn good. I got my hands on the Xperia Ion Monday night and I think this might be my favorite of the Xperia series of smartphones. The display is roomy but not oversized, while the interface feels snappy and smooth. AT&T coverage was dismal (meaning there was absolutely no signal) at the event I attended, so I couldn’t test LTE speeds. But let’s talk about that camera. Sony Ericsson (which is now rebranded as Sony, in case you didn’t notice) has a strong tradition of producing phones with high quality camera lenses. I only took a few snapshots, but I was impressed with how the Ion’s camera handled the dimly lit show floor. The Xperia has a 1280-by-720-pixel display, which uses a mobile version of Sony’s Bravia Engine. This is the same technology that Sony uses on its Bravia line of HDTVs and the company claims that the Bravia engine helps the Xperia display colors and tones in a life-like fashion. The display looks great with bright colors, sharp text, and good viewing angles. The Ion is compatible with a dock so you can view it on a larger display. It's similar to the Motorola webtop experience (as seen on the Atrix 2, Droid Bionic and Droid Razr): You can send texts, play music, and view photos from the Ion on your TV. According to Sony, you can also control the phone from any TV remote. The Xperia is a Playstation-certified device, meaning you will be able to download and play classic Playstation and Playstation Portable games on the phone. The Xperia has an near-field-communication chip built in and will be able to read content stored in NFC chips. Alongside the Xperia, Sony will be shipping NFC-enabled "Smart Tags" that can be programmed with up to 10 commands. When you touch the phone to one of these tags, the programmed commands will automatically take effect. For example, you could have a Smart Tag in your office that, when touched, would automatically turn on the Xperia’s Wi-Fi and launch the calendar. The Xperia Ion doesn’t have a price nor a release date yet, but hopefully we’ll see it in the next few months. The Sony Xperia Ion sounds impressive on paper, but has a few shortcomings that keep it from being on top. Ships running an old OS. Navigation buttons don't always work.